I have enjoyed many great meals at Italian restaurant, Angelini, over the years, and was excited to be invited back recently to try some of the new dishes from the new chef, Alessandro Angelini. The fact that the restaurant and its new chef share the same name is pure coincidence. These are the dishes I tried (all images are clickable). 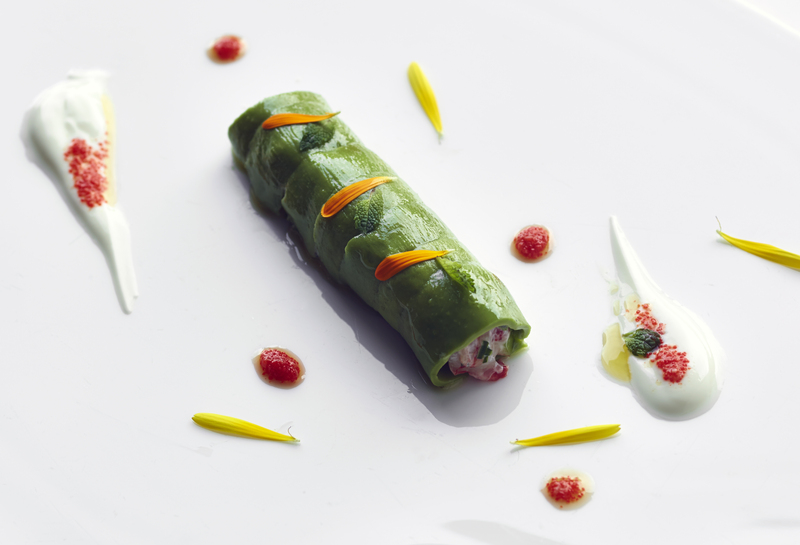 Raw Sicilian red prawns, avocado, green apple and yoghurt sauce. A must-try, bursting with flavour, tasting as good as this image, perhaps better! 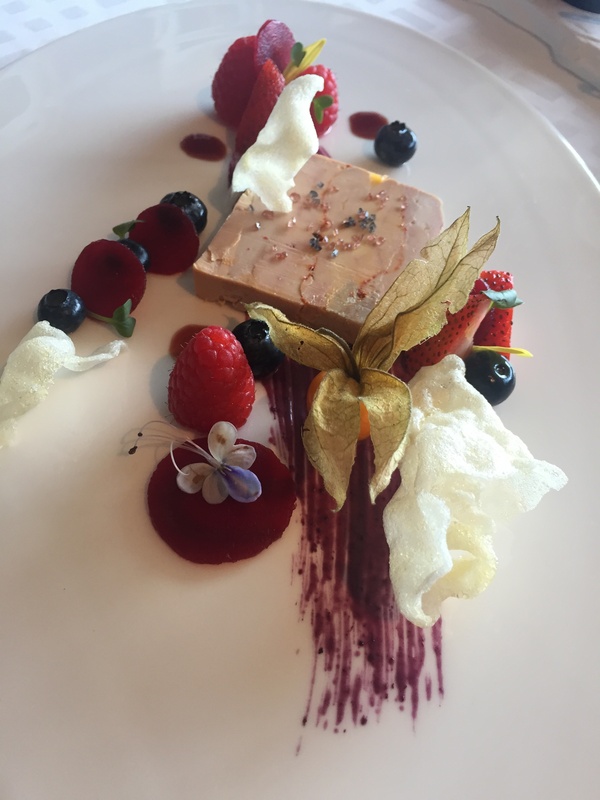 Spicy goose liver terrine, wild berries and white balsamic vinegar. This dish had great balance with the acidity (from vinegar) and freshness (from fruit) offsetting the richness of the terrine. I do think the spice could be amped up, too subtle in my opinion, but I thoroughly enjoyed it anyway. Black truffle risotto with spring onions and sea urchin. Wow! 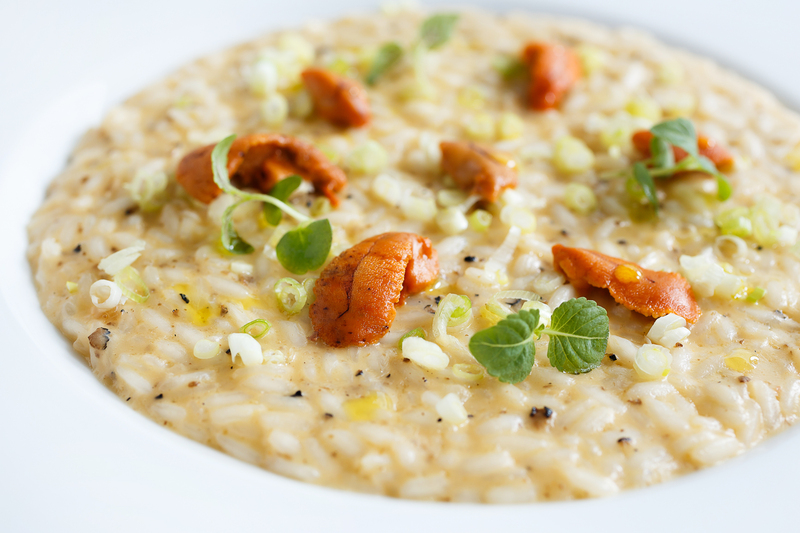 The dish contains Italian sea urchin (salty and strong flavour) within the risotto itself and is finished with sweet Japanese urchin, giving it a distinct flavour – a rich but light dish that is truly memorable. Think it could have had more truffle, but then again I do not think you can ever have too much truffle. 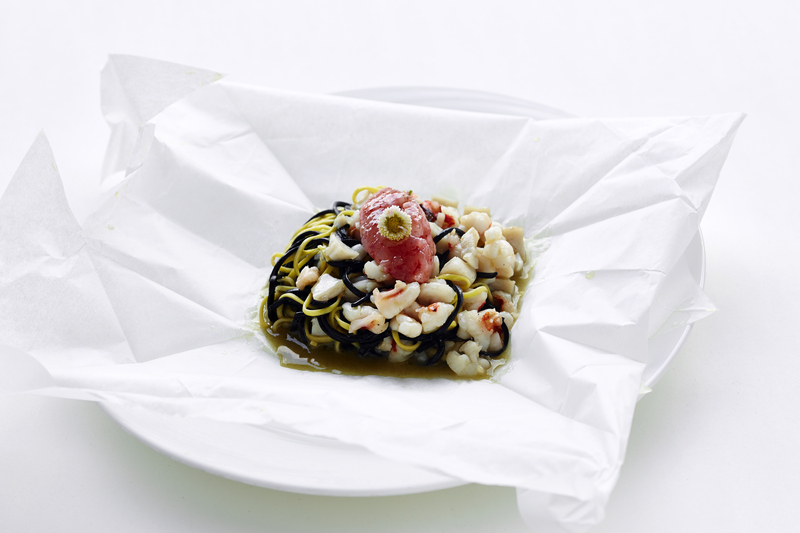 Home-made black and white tagliolini with scallops, king prawns and red shrimp, served in an origami parchment box. The dish entices the moment it hits the table with its uber cute presentation (see next photo) and seduces you when you open the box with its seafood aroma. Perfectly cooked pasta and the combination of raw and cooked seafood inspired – a standout dish. 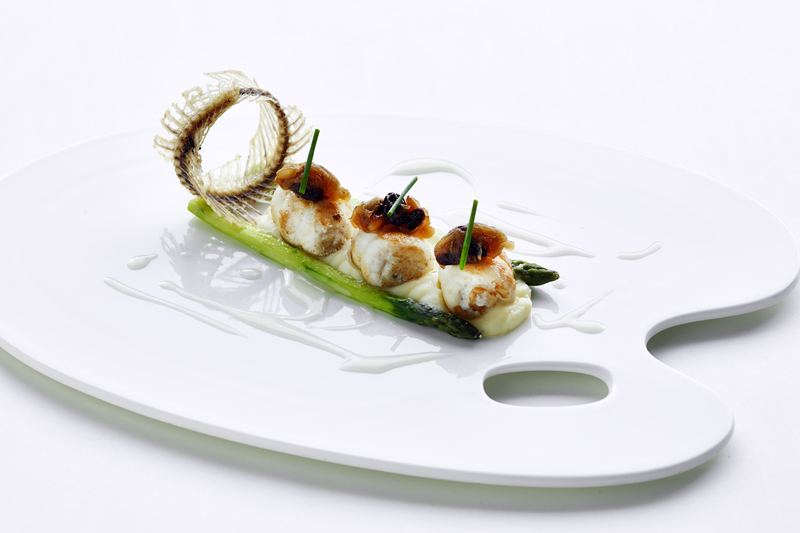 Dover Sole in “Savor” style with gratin asparagus. 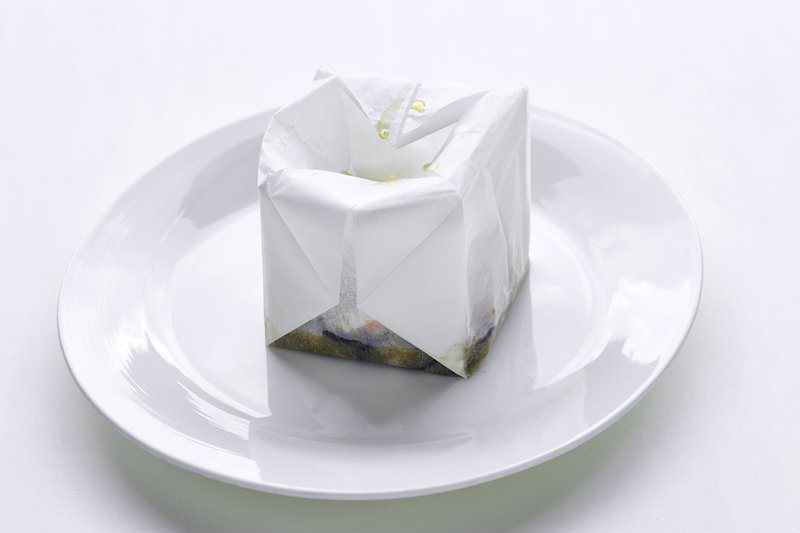 Savor refers to the topping of the fish, a traditional combination of caramelised onion, raisins and pine nuts that graces even the most humble tables in certain regions of Italy. This is a high-end version and gives complexity and depth to the fish. A dish I would order again. Have to admit that my favourite part was the deep-fried fish skeleton, which is edible (make sure to chew well) and brought back many childhood memories of crispy fish tail – my own Proustian moment. I also tried the lamb with mixed vegetables (including young Italian eggplant, mushrooms and edamame) with a yoghurt sauce. Which was excellent, but no pic. Finishing the meal with a vibrant passionfruit sorbet. I look forward to a return visit to try some of the other new dishes from this passionate chef, many of which use local and ethically sourced ingredients.